Maybe it's me. Maybe it's this site. Maybe it's because this site is about advertising and the readers are hip to the click....so they don't. When Google AdSense text ads were added to this site, it turned out to be a very profitable venture. That was 6-8 months ago. Over the past several months, AdSense has gone from a profitable venture to one that now brings in less that pennies per day. I know Google has messed with how they compensate websites though AdSense but this is ridiculous. While traffic to this site has grown exponentially upward, income from AdSense has gone exponentially downward to the point where the text ads are just a useless waste of space. Are there any Kevin Lee-like search engine marketing experts out there that can shed some light on this? While we Americans are getting all up in arms about 9/11 imagery in presidential ads, a candidate in the Taiwanese presidential election ran an ad that compares the sitting president to Hitler. The ad appeared in three of the nations largest daily newspapers. 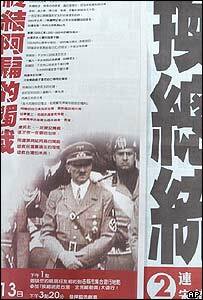 It was placed by the Kuomintang-led opposition for candidate Lien Chan and likens Taiwanese President Chen to Hitler. Of course, everybody got irate, issued pompous quotes and finally apologized. Politics are the same everywhere. The man most famous for his incoherent mumblings wants to be your pitchman. That's right. Marlon Brando has a demo tape on CED Voices, a voice talent search engine. Listening to the demo, you can just picture him gasping for air between every utterance as his body bulges outward and out over the edges of the stool he sits upon in front of the mic. Pop hottie Britney Spears has signed a deal with Elizabeth Arden to develop and market a line of fragrance, skincare and color cosmetics. In an effort to change its luck with teenage appeal, Elizabeth Arden is tapping Spears to get the cobwebs out of the older-focused cosmetics company. Now if she can stay "married" to this deal longer than a day, Spears might actually do some good for Elizabeth Arden. The Apple iPod has taken over the St. George subway station in Toronto. 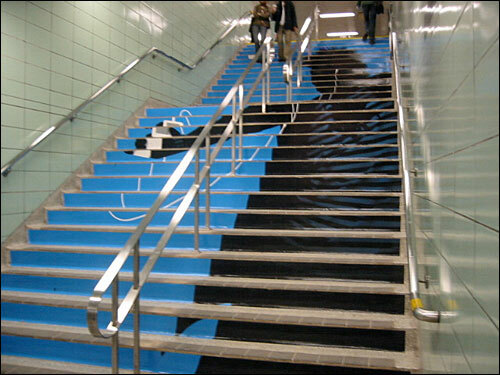 Basically everything in the station has bee grafted with Apple iPod imagery even the staircase which was turned into a gigantic version of the print campaign. While expensive, these roadblock campaigns are very effective in achieving instant awareness as well as bonus press coverage. Thanks to Adrants reader Barry L. Ritholtz for spotting this.